You probably know if your PC is running Windows XP, Vista, or 7--but do you know which version of Windows it is? For example, is it XP Home? 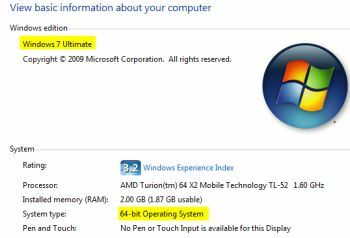 Windows 7 Ultimate? And is it the 32-bit or 64-bit variety? Knowing the answer to the last question is increasingly important these days, as you can't run 64-bit software on a 32-bit OS. Likewise, if you do have 64-bit Windows (often referred to as "x64"), you should always opt for 64-bit versions of your favorite applications (when available). Windows doesn't paste this information anywhere in plain sight, but it's easy enough to find. In Vista and 7, right-click your Computer icon and choose Properties. Presto: all the information you need in one handy box. You can also click the Start button, type version, and then click Show which operating system your computer is running.